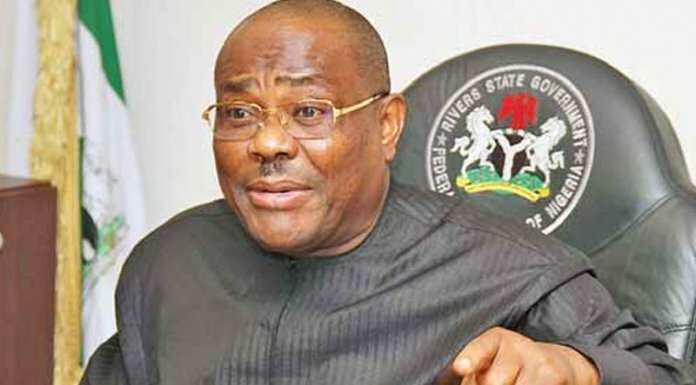 Rivers State Governor Nyesom Wike has declared that the removal of the Chief Justice of Nigeria (CJN), Justice Walter Onnoghen, is the conclusion of the All Progressives Congress (APC)-led Federal Governmentâ€™s hijack of the judiciary. Wike said the federal government was trying to intimidate the judges of the Court of Appeal into giving a legal stamp to the suspension of the CJN. The governor alleged that Rivers State was a primary reason for the intimidation of the judiciary, stressing that the appellate court is being put under pressure to reverse judgements against the APC in the state. According to him, â€œThe suspension of the CJN is unfortunate. I raised an alarm when the federal government tested the waters by going to abduct judges in the midnight. I knew what the federal government intended to achieve. The whole essence was to put the judiciary in their pocket. The governor said the challenge before of Nigerians was to rise up in defence of the countryâ€™s democracy and judiciary. â€œBeside condemnation, concrete steps must be taken to ensure that they change their minds. There is no way that Satan can change his mind by mere statements,â€ he said. â€œThis unconstitutional action of the president has several negative ramifications. A governor who hates his State Chief Judge can concoct a petition and unilaterally remove him,â€ he said. According to the governor, â€œThe Minister of Transportation told his party men that Buhari will use all forms of illegality to achieve his aim. The president wants to act against states where the party is having crisis.